January 2018 saw the introduction of 2 new members into the club. The picture below shows Paul Hutchinson and Jai Krishnan with club president Jenny Lumley. In his year of office ( 2016 - 17 ) past president Ian Barnes presented Melvin Jones Fellowships to 3 very deserving Lions. These awards are given in recognition of outstanding service to the Club. The picture shows recipients Tom Peacock, Pat De Martino & Robert Hillary with past president Ian Barnes. On 30th June Jenny Lumley was installed at the new president of the club. The picture shows her being congratulated by outgoing president Ian Barnes who is receiving his past president's pin from Jenny. PRESENTATION TO LION TOM PEACOCK. At the club's annual Charter Dinner & Handover evening on 30th June 2017 Club president Lion Ian Barnes presented the Melvin Jones award to Darlington Lion Tom Peacock ( right ) for 45 years outstanding service. On 1st July 2016 Ian Barnes was installed as President of the club. The picture shown Lion Ian (on the left) with the chain of office and the outgoing president Lion Denis Pinnegar. Richard Western - Past President and winner of our recent night out at the Darlington Quoits Club. January 2016 saw the 90th Birthday of Maisie Dawkes. Maisie's late husband Ken was the 105 NE District Governor in 1990 -91. Maisie is still a fried of Darlington Lions and helps out with baking for various functions. To mark this occasion club secretary Sandy Duncan presented her with a bouquet from the club at her bungalow in Melsonby, North Yorkshire. left a 20 year service medal for Darlington Lion Charlie Headon who has recently been in poor health and unable to attend meetings and he wished Mr Headon a very good & hasty recovery. Lion Tony Gent - Darlington Lions Club vice president Jenny Lumley.Vice District Governor Dave Wheeler & Lion Sandy Duncan. The main charity for 2015, chosen by club president Pat De Martino, is ECCDS - the Education Centre for Children with Down Syndrome. 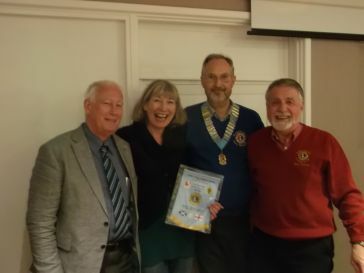 Jo Walker & Sandy Hart fundraisers of ECCDS visited Darlington Lions Club at their meeting at Darlington Cricket Club to present the members with a certificate of thanks & appreciation for their support in the coming year. Recently, while clearing out a member's garage a beautiful table decoration was unearthed. It comprises some 40 international flags mounted on a hardwood timber block. It was given to Darlington Lions the by the Ladies of the club many years ago but had been stored away for safe keeping and forgotten!!!. However it has now been beautifully refurbished and restored to its former glory ( complete with new carrying case ) by Lion Robert Hillary. Darlington Lions Club president Pat De Martino. Darlington Probus Club chairman Kathy LeRoy. Young Leaders in Service, The Peace Poster Campaign, Young Medics Alert for 0- 10 year olds and the MD Disaster Fund which will soon be called upon to assist with flood victims. The Immediate Past District Governor Lion John Sutherland visited Darlington Lions Club in February to present the club with the Club Excellence Award. Darlington Lions Club Immediate Past President Tony Gent received the distinguished Banner Patch to display on the club banner and he also received a Club Excellence Pin to recognise his outstanding leadership during his year in office. Clubs that excel in community service, membership growth, communication and organizational management may qualify for the prestigious Excellence Awards. Immediate Past District Governor John Sutherland presenting the Banner patch & Club Excellence Pin to Immediate Past President Lion Tony Gent. Tony Gent, Darlington Lions President presents Richard Western with a crystal pin in recognition of his achievements. Richard Western, Past President, Darlington Lions Club has earned the International President's Membership Achievement Award for significant progress and development of the club while in office. His main achievements were the 20% increase in membership numbers and the successful 50th anniversary of the Club Inauguration and the 50th Charter Dinner. Darlington Talking Newspapers and Darlington Multiple Sclerosis, were given the largest donations of £2,000 and £6,500 respectively and a 1000 books were sent to Africa from our bookshop in Blackwellgate Arcade to assist with the education of children. Two stalwart Darlington Lions Club members Dave Nicholson and Ian Barnes reached a milestone with the club serving 40 years each and received chevron badges marking their long service to the club.. Both have enjoyed being at the forefront of fundraising over the years and many chosen Darlington charities and worthy individuals have benefited. Ian was the President in 1981 and 2006 and recalls the donation of £2000 given to the Darlington Memorial Hospital in 2006 towards a new portable Echocardiograph machine which is an ultrasound recording of the main features of the heart. Dave had to be a Lion at large for six years in the 1980s as his employment as a construction manager took him to Zambia and Saudi Arabia, but he kept in touch with his local Darlington Lions Club. Dave also has worked in our local Darlington bookshop on a Friday in Blackwell Arcade for the last 20 years and wanted to thank the residents of Darlington for donating their books over many years. Tony Gent, President of Darlington Lions Club said 80 years between them was a great achievement and the club has benefited from their dedication, commitment, and willingness to help others. In 2011 these magnificent seven Darlington Lions pictured accrued a total combined service of 270 years. Tom Peacock is our oldest current member of Darlington Lions Club with 42 years service. All of these Lions have served the club in many different roles too numerous to list. However one of the main objectives has been to engage with their local communities providing a service to improve the quality of life for many in Darlington. Richard Western the current Darlington Club President commented that 270 years combined service from seven of the members was a fantastic achievement and one of which the club should be proud. Photo shows - top left to right - Tom Peacock 42 years, Ian Barnes 39 years, John Clulee 40 years, Denis Pinnegar 38 years - front row - left to right - Bob Martin 36 years, Dave Nicholson 38 years and Fred Thompson 37 years. At a recent "end of the President's" year party in July 2011 Tom Peacock was presented with a President's award plaque for 42 years dedicated service to Darlington Lions Club. Tom joined the Darlington Lions in 1969 just eight years after it was formed and played a big part in our 50th celebration held in June this year at the Blackwell Grange Hotel. Tom organised many archive photos and write ups recording the clubs formative days at our 50th celebration. Tom has been President twice and Chairman of most committees and he recalls the first time as President in 1975 when there was a parade to mark 150 years of the Darlington & Stockton Railway. That was the year Tom, as President of Darlington Lions, gave £2000 to a special needs school at Harrogate Hill, Darlington to assist in the cost building a play area. Richard Western, President, commented that Tom had been an outstanding Darlington Lion and thanked him for his truly dedicated record number of 42 years service in our club. Pat De Martino & Jean Pinnegar. 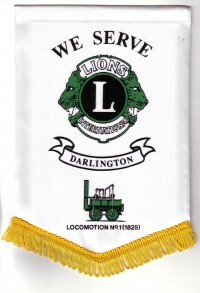 As Darlington Lions Club looks forward to celebrating its 50th Anniversary on 19th June 2011, the membership is changing and growing. Club, President, Richard Western inducted and welcomed its first four lady members into the club on 26th April 2011. Pat De Martino and Jean Pinnegar are former Darlington Lioness members with much experience in how the Lions assist their local communities. Sylvia Western, the President's wife and Katie Johnson are new to Lionism. Richard Western, Darlington Lions Club, President commented, having seen membership stagnate over the past few years and present members getting older, this is an exciting new chapter in Darlington Lions club's development. We can now look forward to a future with fresh energy and new ideas on how to help our community. And hopefully - even more members! Darlington Lions Club wishes our new lady members every success. We meet on the second and fourth Tuesday of each month at 7.30pm ( except July & August) at the Darlington Cricket & Athletic Club, South Terrace Tel:- 01325 250044. The Immediate Past District Governor Lion John Sutherland visited Darlington Lions Club in February to present the club with the Club Excellence Award. Darlington Lions Club Immediate Past President Tony Gent received the distinguished Banner Patch to display on the club banner and he also received a Club Excellence Pin to recognise his outstanding leadership during his year in office. Clubs that excel in community service, membership growth, communication and organizational management may qualify for the prestigious Excellence Awards.Immediate Past District Governor John Sutherland presenting the Banner patch & Club Excellence Pin to Immediate Past President Lion Tony Gent.